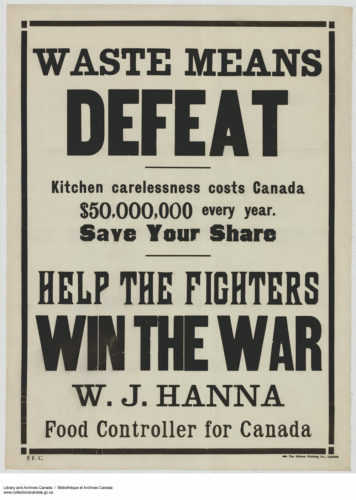 In June of 1917, the Canadian Government introduced the Office of the Food Controller under the direction of Conservative Ontario politician and businessman, W.J. Hanna. 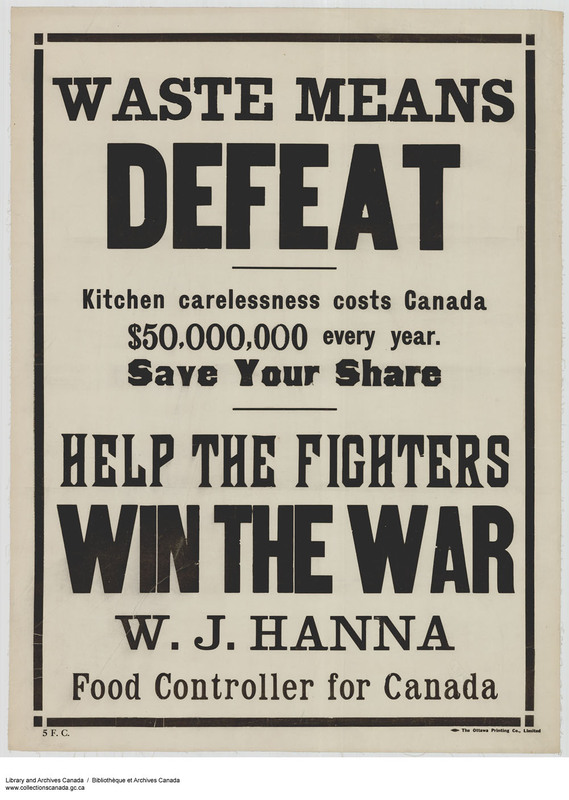 The introduction of Food Controller during the First World War was part of Canada’s recognition that they were one of the main sources for food staples to Great Britain. 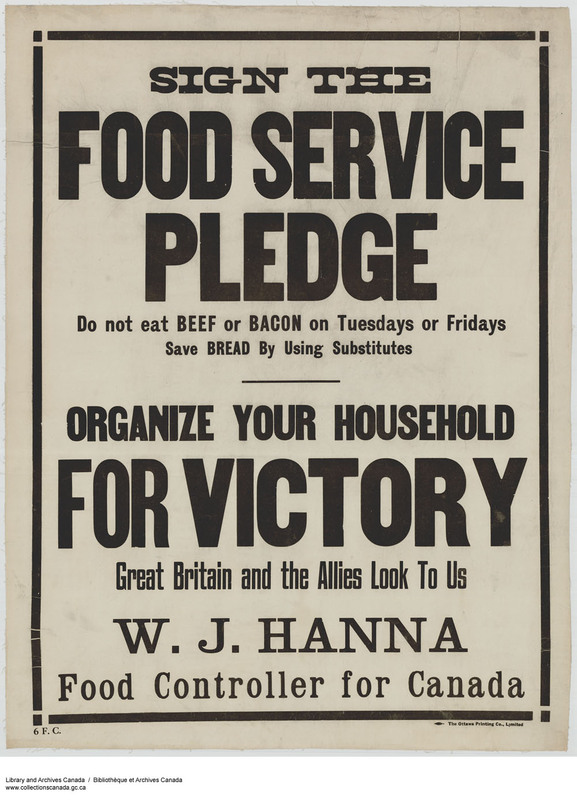 One of the Office of the Food Controller’s main goals was to educate the public on how to reduce their use of essential foodstuffs like beef, bacon, and wheat, that were high in energy source and easily shipped overseas. The government encouraged women to voluntarily free up these essential food products by changing their food consumption and diets. The Food Controller encouraged the use of less popular cereal grains and flours, cheaper cuts of meat, and larger amounts of fresh and persevered local produce. Kitchen managers were also encouraged to free up food for the Allies by reducing their food waste. As part of their educational efforts, the Office of the Food Controller published a variety of pamphlets that explained the importance of food control through careful meal planning and thoughtful waste reduction. While these pamphlets did not include specific recipes, they clearly emphasized the threat of food waste and encouraged Canadian women to alter their families’ eating habits from the extravagant diets that had been a feature of the pre-war era. The “Waste Not – Want Not” section in the government-published Food Service: A Handbook for Speakers called food waste in a time of war a crime. It professed that Canadians wasted at least $50,000,000 in food every year and warned women to guard against “waste in the kitchen and pantry” and in the dining-room. They suggest that instead of throwing bones into the garbage that that “every scrap of marrow” should be boiled out and made into soup. As a handbook for speakers, the suggestions for waste reduction made in Food Service focused on using the facts to demonstrate the importance of food control to the war effort. 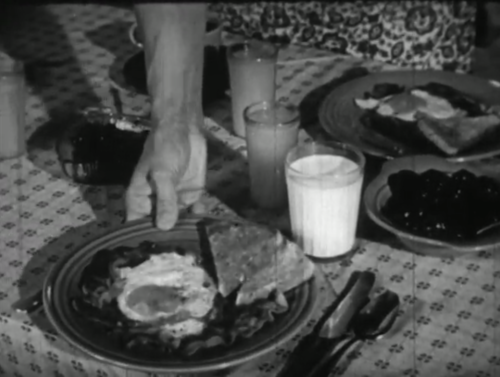 The government suggestions in War Meals include ideas for conserving wheat, like diluting wheat flour with other grains, potatoes, and cooked breakfast cereal. War Meals provided some ideas on reducing food waste by preventing food spoilage and through transforming one food product into another. Bread, it was noted, could be saved by cutting no more than needed and drying it thoroughly to save from mould if it could not be finished. Leftover cooked breakfast cereal could be added into batters and doughs, and leftover bread could be made into “new bread, cake or puddings.” Cooks were encouraged to waste no ham and salt pork (used as a bacon substitute), as “even the rind and bones … [could be conserved] for the flavour” they provided to other dishes. Locally grown vegetables and fruits could be preserved to prevent their spoilage and to lengthen their enjoyment into the winter months. The Office of the Food Controller knew that its primary audience was women and that their work as kitchen managers was essential to reducing food waste. Throughout their literature, it acknowledged the pride that women took in providing plentiful and varied diets for their families. 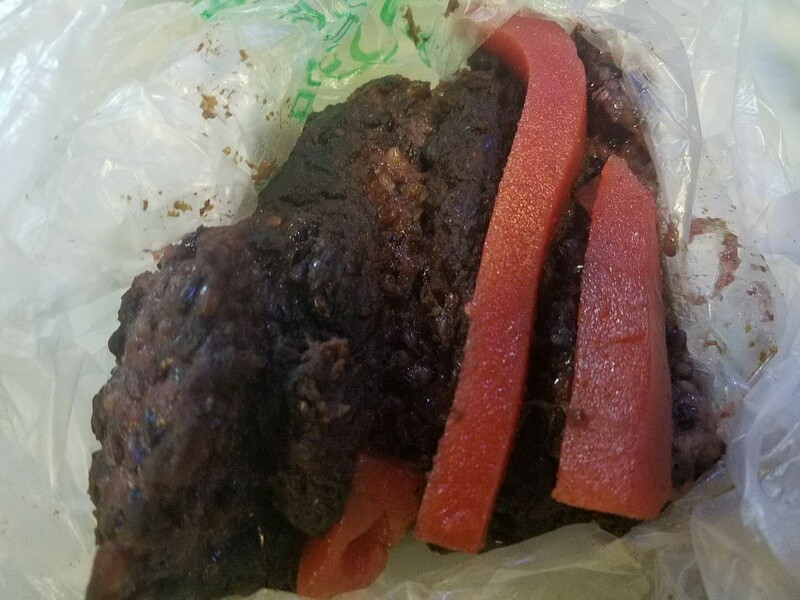 The Food Controller’s appeal asked that the “foolish notion that carefulness in serving food without waste is ‘stinginess’” be abandoned in the name of duty and common sense. 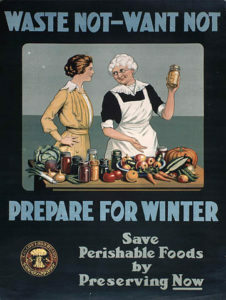 The Office reinforced the expertise of women by suggesting that cooks use and modify their favourite recipes; their “ingenuity will devise many ways of saving” important foodstuffs for the Allies. 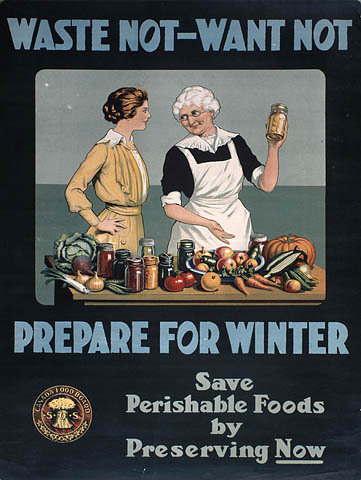 By recognizing the importance of women to the food situation, the government was simultaneously reinforcing gendered boundaries of work while also encouraging women to participate fully in the war effort as citizens. There is a right way and a wrong way to do everything, or so argued the creators of Coronet Instructional Films. 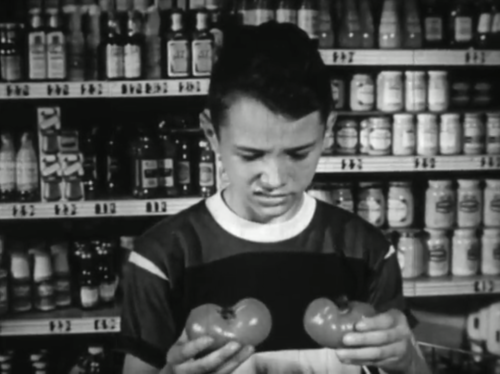 In their mission to educate American youth in the post-World War II decade, the Coronet film catalog made sure that children and teenagers knew the steps to right living. In their filmography, one can find ten-minute fictional prescriptive films produced on seemingly any topic of concern to the young student: family relationships, school, social life, dating, exercise and hygiene, and food and diet. Beyond their kitsch value, Coronet’s films (and those of their contemporaries) offer scholars a rich source on the ideological dimensions of public education in the immediate postwar decade. After decades of social instability caused by rapid urbanization, economic depression, and war, proponents of “Life Adjustment Education” believed that the key to new social stability and economic prosperity was education. These Life Adjusters were ready with two intellectual tools to remake American education. In one hand was their reading of American pragmatic philosopher John Dewey’s (1859-1952) writings on progressive education; in the other was the latest psychological research into the developing minds of children and adolescents. Life adjusters sought to educate “the whole child,” including that child’s physical and social needs. This tradition began to fizzle after Brown v Board of Education (1954) and Sputnik (1957) brought national urgency to issues like racial justice and scientific literacy. Art’s mother brings breakfast to the table. Image credit: The Internet Archive, A/V Geeks Collection. Coronet produced the bulk of their filmography from 1947-1953. During this time, their staff researchers drew from life adjustment discourses while writing film scripts and corresponding with educational collaborators. Together, filmmakers and educators produced many dozens of films that offered direct advice to their young viewers. Art’s poor dietary habits separate him from his peers. Image credit: The Internet Archive, A/V Geeks Collection. 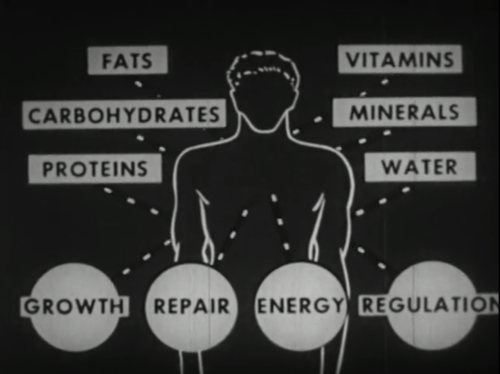 The Food that Builds Good Health is a 1951 film that excellently depicts the concerns of life adjustment educators. 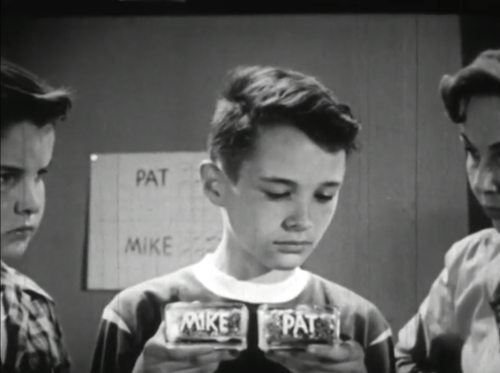 Intended for elementary school children, the film’s main subject is a young boy named Arthur (Art) Baker who “is pale and underweight [and] doesn’t have much energy.” As an off-screen narrator explains the importance of good diet, viewers watch a day in the life of Art. He begins his morning by barely touching his home-cooked breakfast. Next, he watches from the sidelines as his classmates play at recess, each “full of vigor and vitality, cheerful smiles bright eyes, [with] strong and husky bodies.” Art, on the other hand, simply cannot keep up. Thankfully, science class helps Art figure out why his health lags behind that of his peers. As an experiment, Art’s science teacher feeds two pet guinea pigs different diets. One is healthy and energetic due to his balanced diet; the other is lethargic, with greasy, matted fur. Art considers the diets of the class guinea pigs. Image credit: The Internet Archive, A/V Geeks Collection. After feeding time with the classroom pets is over, Art’s teacher leads the class in an explanation of food and diet. Viewers learn that proteins, carbohydrates, fats, vitamins, minerals, and water are all important in the body’s growth, repair, energy, and regulation. And to get these healthful nutrients, it is explained, one must eat foods from across the spectrum of food groups: “milk; vegetables; fruits; eggs; meat, cheese, or fish; cereal or bread; butter or margarine.” The narrator continues, “It’s up to you…if you do eat the right foods regularly, your body will get all the materials it needs for good health.” The latter half of the film shows Art take this message to heart, as he helps his mother with the grocery shopping and commits to “eating a good helping of everything from the table,” even the foods he does not like. 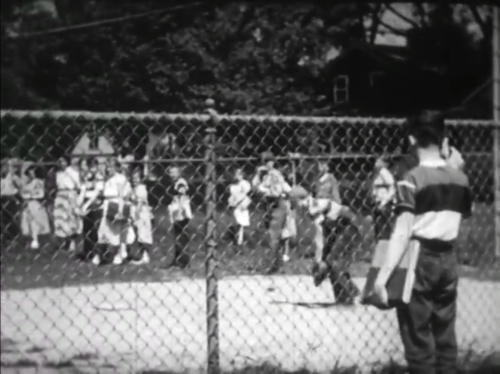 The final scene shows Art, now healthy and energetic, preparing to play baseball with his classmates. The building blocks of good health. Image credit: The Internet Archive, A/V Geeks Collection. “Art is not so fond of tomatoes, but if they help make us healthy, he’s willing to eat them. And who knows, he’ll probably grow to like them.” Image credit: The Internet Archive, A/V Geeks Collection. The Food that Builds Good Health works in the grey area between familial authority and school authority. The film is careful not to contradict the parental prerogative: Art gets all of the food that he needs at home, he simply refuses to eat it. His picky eating and subsequent “malnourishment” is a habit that his hapless parents have allowed to develop. Thankfully, the school is able to step in and correct Art’s behavior through rational persuasion: stating the facts. Armed with these facts, Art takes his health (and his life) into his own hands, much to his mother’s delight — and all in the space of ten minutes. Harl R. Douglass, ed., The High School Curriculum (The Ronald Book Company, New York, 1947), p. 173. Jonathan MacDonald is the Project Coordinator for Before ‘Farm to Table’: Early Modern Foodways and Cultures, a Mellon initiative in collaborative research at the Folger Institute of the Folger Shakespeare Library. He holds a M.A. in History from Virginia Tech, where he completed a thesis on the social-scientific roots of mid-twentieth century American educational films. This summer, I started a journey to explore Manchu (Manzu) food both in books and in real life. After reviewing A Comprehensive Manchu-English Dictionary written by Jerry Normanin May, I thought that flour-made foods are very important in the Manchu daily diet. The word efen appear quite a lot in the dictionary. According to Norman, it refers to “bread, pastry, cake and any kind of bread-like product made from flour.” To understand what efen looks and tastes like, I took a short trip to Beijing where a substantial Manchu population has lived since the Qing dynasty (1644-1911) to search for traditional Manchu efen. I consulted a friend of mine, whose family has lived in Beijing for several generations, about where to look for traditional Manchu food. He recommended Ox Street (Niu jie) as the best place to find the most authentic and traditional Manchu efen. Ox Street is actually a neighborhood centered around Muslim communities rather than Manchu inhabitants because of the Ox Street Mosque, the largest mosque in Beijing, which was built in the Liao dynasty (907-1125). I found a vendor selling varieties of efen called Hong Ji Xiaochi Dian. 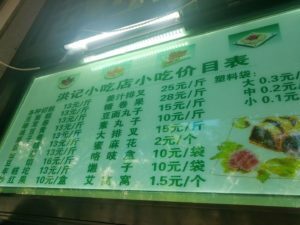 This small restaurant consisted of two counters, one selling braised meat and another selling grain-based foods which are known in Chinese as staple foods (zhushi). I felt that this vendor is a practical food provider for local residents and does not primarily cater to tourists. The staple foods counter was popular with a long queue in front of it. All the customers except for me were native Beijing people with pronounced Beijing accents. 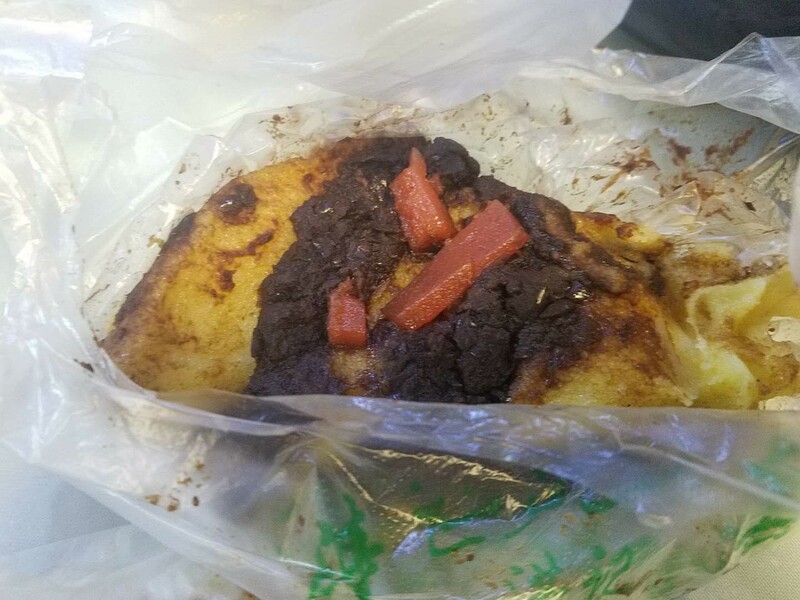 The salesperson insisted that the minimum portion of efen sold should be a quarter-kilogram and dispensed the efen in plastic bags. Both of these conditions suggest that efen is meant to be eaten shortly after being purchased and is not packaged to be distributed over long distances, as souvenirs would be. The following three pictures are the efen I bought and tried on site. These efen are cut and sold by weight. Since they are so soft and sticky, the efen do not look visually appealing, but they were the most delicious I have tasted. 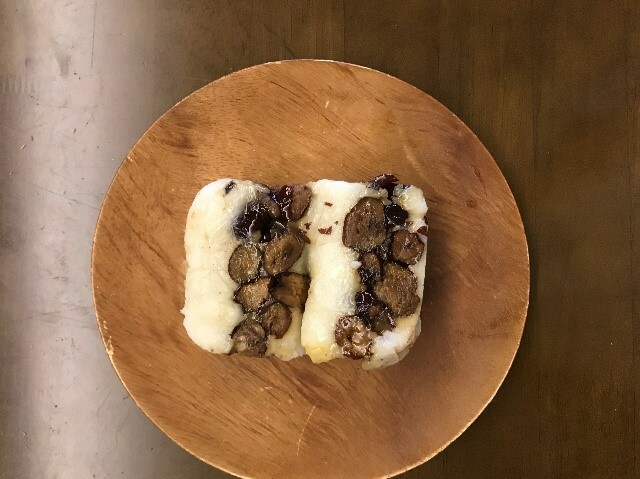 The red bean paste was not overly sweet, and its taste and smell were that of real bean rather than artificial flavoring. The rice flour similarly smells like fresh rice. 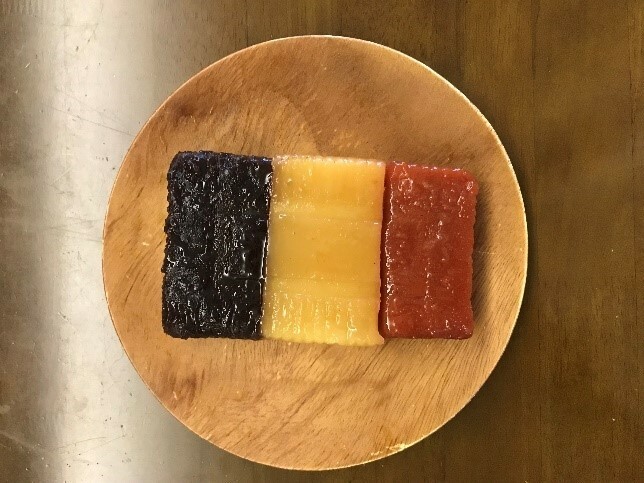 The sour taste of the haw, the red strip on the efen, lessened the sweetness.Normally, I find Chinese cakes to be filling in very small amounts but I finished a whole quarter-kilogram of efen within fifteen minutes. 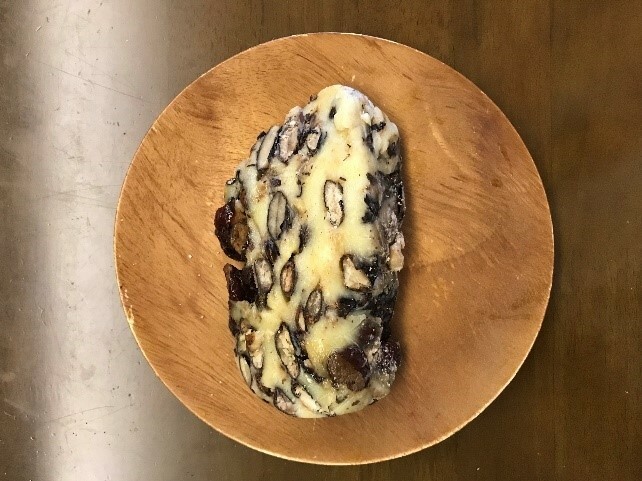 The next three pictures show efen containing jujube and milletas described in Jerry Norman’s dictionary such as tūmen efen defined as “steamed millet cake.” When I smelled this efen, I could easily detect the genuine scents of jujube, rice, millet, black rice and haw. I was impressed by how the distinct smells and tastes of the grains and fruits were preserved well in this type of food. Reflecting on this journey, I found what confused and fascinated me most is the identity of the efen. 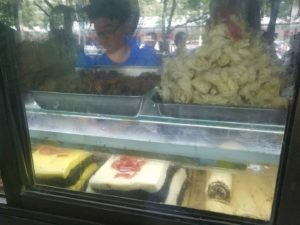 As a person of Han and Manchu ancestry, I went to a place known as a Muslim neighborhood surrounded by an ethnically heterogeneous group of “Beijingers” looking for authentic Manchu food. Although the efens in the Ox Street resembled most to the description of Manchu cake in all the readings I reviewed, finding them was not a straightforward process. 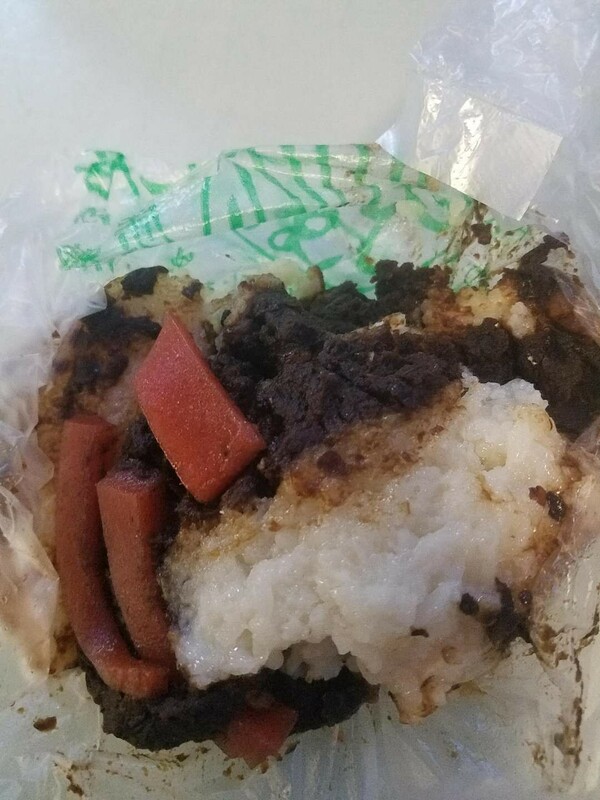 When I asked for help to search for Manchu food, native Beijing people could only think of places selling “Old Beijing cuisine (Lao Beijing cai),” not cakes or other foods that may be eaten separately rather than as components of meals. I also received few recommendations for establishments that are not part of restaurant chains. “Manchu food” has been popularized by companies like the Daoxiang Village (Daoxiang cun) restaurant group but to someone like me who has grown up eating homecooked Manchu food, the adaptation of such cuisine to suit non-Manchu people’s tastes is obvious. Furthermore, I noticed that the efen I found looks similar to Korean sweet rice cakes (tteok). Given the historical flow of commodities and movement of people between Northeast China and the Korean peninsula, it is hard to conclude that efen is only a Manchu food or a Beijing Manchu one. I will do more taste tests in the city of Shenyang in Liaoning province, which is also considered a Manchu cultural center like Beijing, and in South Korea to substantiate textual interpretations of efen with comparative physical manifestations. Jerry Norman, A Comprehensive Manchu-English Dictionary (Cambridge, MA: Harvard University Press, 2013), 90.
by the Ziff-Davis Publishing Company, with illustrations by Jan Balet. Author’s Collection. However, once the war was over and it was time for women to return fully to the home, Rosie the Riveter transformed into June Cleaver, that apotheosis of the happy housewife historian Joanne Meyerowitz has called the quintessential white, middle-class woman “who stayed at home to rear children, clean house, and bake cookies.” Within this historical context, Dorothea “Zack” Hanle and Martin Herz’s children’s book from 1945, The Golden Ladle, becomes a potent example of how the culinary discourse of the postwar period circulated images of white, middle-class womanhood as both idealized and sophisticated home cooks rather than members of the kitchen infantry. Even more, though, Hanle and Herz’s book demonstrates how dominant culture appropriated the image of the enslaved mammy to invest middle-class white women with the same “magical” powers attributed to black cooks from the antebellum period onwards. In this way, The Golden Ladle remakes household cookery into a new kind of empowerment: not the double-duty of domestic and industrial work done on behalf of Uncle Sam but, rather, the work of a professional-amateur cook who combines the homespun wisdom of the mammy with a burgeoning culinary cosmopolitanism—one that presages Julia Child and the Americanization of continental cuisine in the early 1960s. And the fact that this white, middle-class woman’s empowerment narrative comes out of a written text is what intellectualizes and professionalizes the new white mammy, thereby distinguishing her from her black female predecessor, who was of either the enslaved or working classes and mostly educated through oral traditions. 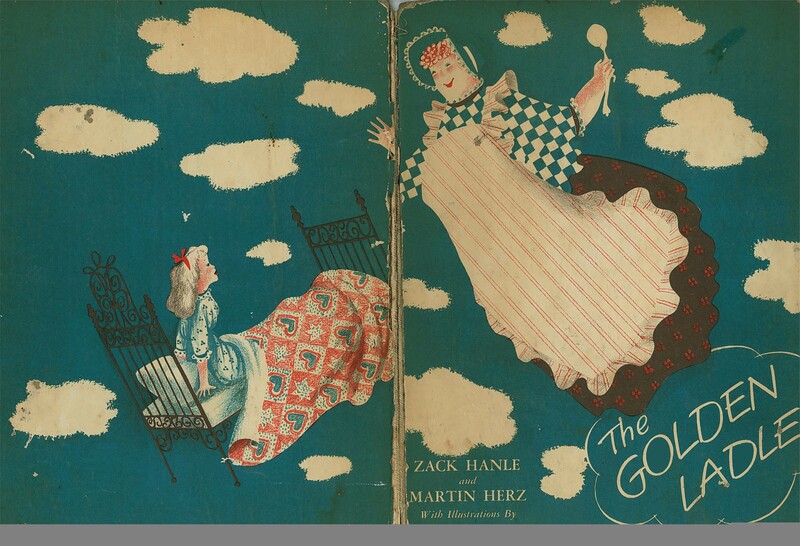 The remainder of Hanle and Herz’s book shows Mrs. Pinafore teaching Jo-Anne how to make “dozens of pretty things” for her party, either by whisking her across the Atlantic to visit little European girls cooking up delicacies in their own kitchens or by conjuring the ingredients for easy recipes while the two of them float above the clouds—Mrs. Pinafore’s preferred method of travel. And while such a plot may seem like nothing more than a fluffy mix of food and fairytale, in fact the cultural work that’s being performed in The Golden Ladle is profound, especially in terms of constructions of femininity, class, and whiteness in postwar America. The Ladies’ Home Journal, October, 1923: 71. Author’s Collection. Numerous scholars have discussed the problematic popularity of the mammy figure in American culture, beginning before the Civil War and extending to the present moment. To offer one example, the mammy is still used to sell Aunt Jemima’s pancake mix, a product and a persona created in 1893 by the R. T. Davis Company for the World’s Columbian Exposition in Chicago. 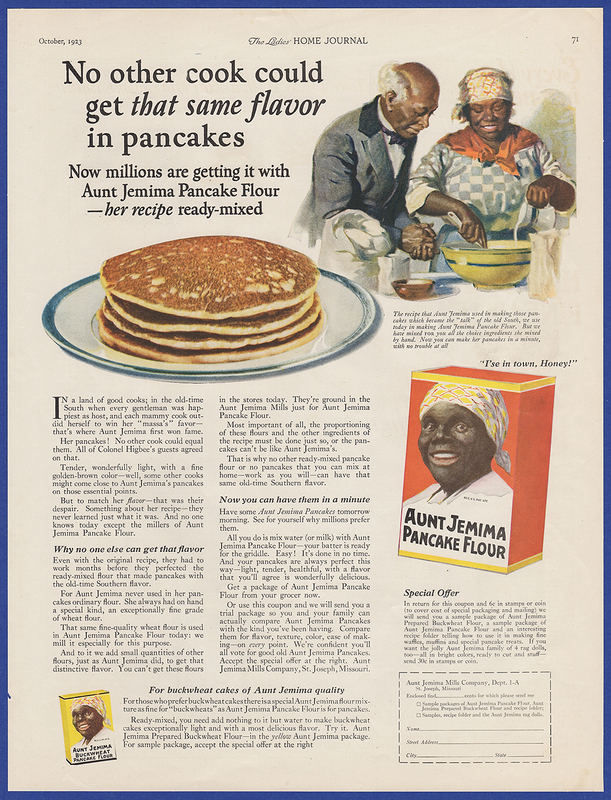 As Toni Timpton-Martin explains in her wide-ranging study of African-American cookbooks, The Jemima Code, this trademarked mammy provides “a shorthand translation for a subtle message that went something like this…: ‘Buy this flour and you’ll cook with the same black magic that Jemima put into her pancakes.’” As represented in this advertisement from 1923, the mammy’s perpetual happiness and culinary intuition—the codes of her mythology—are appropriated by white women who wish to harness her abilities for their own domestic proficiency. In body and behavior, Mrs. Pinafore is just such an appropriator—even though she doesn’t keep a mammy on a box in her cupboard. Rather, Mrs. Pinafore is a new kind of mammy. Wearing a self-referential pinafore and waving her magic ladle, she’s described as the “roundest, fattest lady” Jo-Anne has ever seen, with “twinkling” eyes and a big laugh. Her cooking is innovative, charming, and foolproof. And while her magical powers are intuitive—seemingly innate, beyond explanation—Mrs. Pinafore is also a writer, which professionalizes her wondrous abilities. the Ziff-Davis Publishing Company, 1945. Author’s Collection. Moreover, by broadening Jo-Anne’s palate and cooking skills in taking her to allied countries—they visit England to make a Tiffin of crumpets and marmalade, Holland to learn Dutch Cheese Snacks, France to create Fruit Candies, and neutral Switzerland to cook Apple Delight—Mrs. 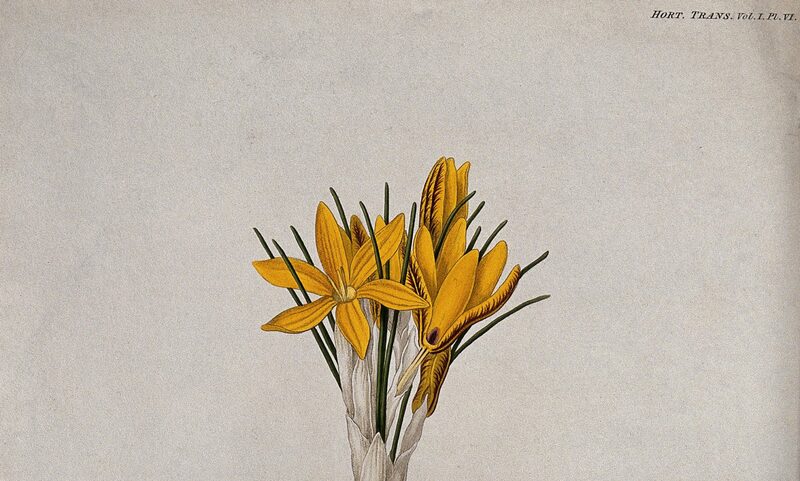 Pinafore both demonstrates her own cultivated tastes and also instills them in Jo-Anne. In this postwar environment, Mrs. Pinafore is a worldly woman, which strengthens her bid as a kind of amateur-professional: exactly the ethos that Julia Child would adopt fifteen years later in Mastering the Art of French Cooking. Because The Golden Ladle is intended for young girls and includes a recipe in every chapter, this narrative is didactic as well as empowering, meant to raise up white, cosmopolitan mammies for a new generation. In fact, it’s clear that Jo-Anne is a white-mammy-in-training. 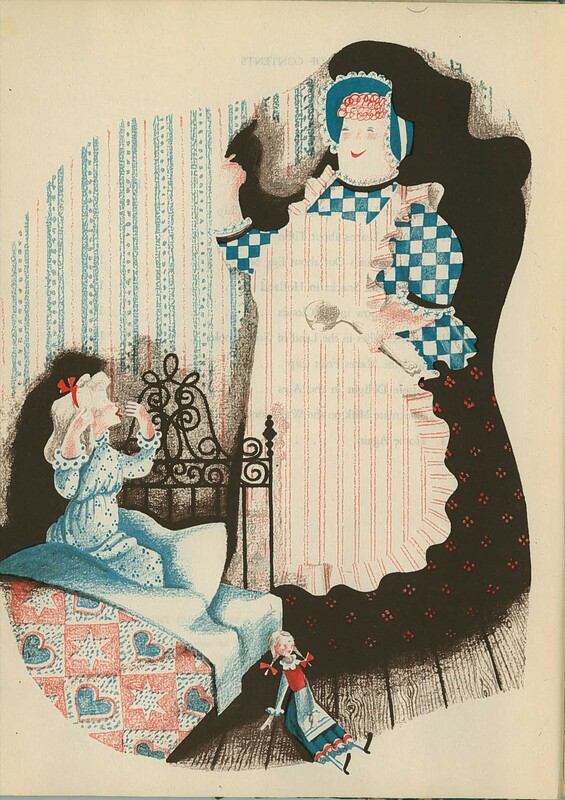 When she overeats Apple Delight, she says to her new Swiss friend named Clara, “Oh, my…, I have been a little pig. But it was so good. I hope you can excuse me.” And, of course, she is excused by both Clara and Mrs. Pinafore. Being “piggy”—having enough heft to throw her weight around—is vital to Jo-Anne’s training. In the end, Mrs. Pinafore’s legacy as a white mammy is handed down by the book itself, so that Jo-Anne—as well as the flesh-and-blood girls reading along—can “grow,” both literally and figuratively, cooking and (over)eating these stylish dainties. Thus, although the white, American female cook of the 1940s does not have the masculine autonomy of her predecessor, Rosie the Riveter, she can still lay claim to a domestic literacy largely withheld from the black mammy—and, thus, to the dual authority of kitchen prowess and culinary authorship as proof of her expertise. Barclay, Tekla. “Pinch-Penny Privates.” American Home (June 1943): 68. Deck, Alice A. “‘Now Then—Who Said Biscuits?’ The Black Woman Cook as Fetish in American Advertising, 1905-1953.” Kitchen Culture in America: Popular Representations of Food, Gender, and Race, edited by Sherrie Inness. Philadelphia: University of Pennsylvania Press, 2001: 69–93. Hanle, Zack and Martin Herz. The Golden Ladle: How to Be a Cook Without Using Fire. Chicago and New York: Ziff-Davis Publishing Company, 1945. Inness, Sherrie. Dinner Roles: American Women and Culinary Culture. Iowa City: University of Iowa Press, 2001. Meyerowitz, Joanne. “Introduction: Women and Gender in Postwar America, 1945-1960.” Not June Cleaver, edited by Joanne Meyerowitz. Philadelphia: Temple University Press, 1994: 1–16. Tipton-Martin, Toni. The Jemima Code: Two Centuries of African American Cookbooks. Austin: University of Texas Press, 2015. Walden, Sarah. 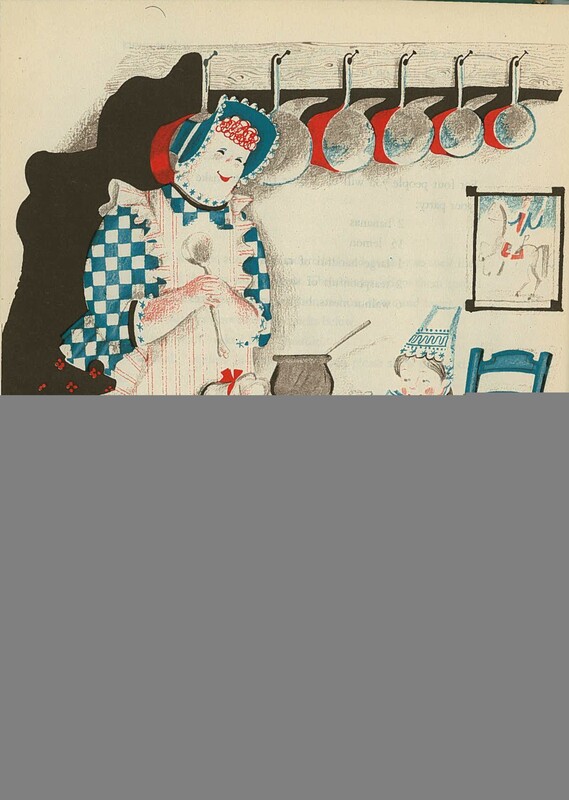 “Marketing the Mammy: Revisions of Labor and Middle-Class Identity in Southern Cookbooks, 1880-1930.” Writing in the Kitchen: Essays on Southern Literature and Foodways, edited by David A. Davis and Tara Powell. Jackson: University Press of Mississippi, 2014: 50-68.